Immediately spotting a weekend gap on Monday market opening and betting on its filling. Gap Trader can be used simultaneously in as many currency pairs as the user wants. Using the magic number feature to separate between any previous opened non-gap-trading positions and gap-trading ones, with the first being unaffected by the use of Gap Trader expert advisor. Magic number is also used for the distinction between gap-trading positions in different currency pairs. On Monday’s market open, if the Friday’s last H1 candle high (low) is lower (higher) than the Monday’s opening price by more than 10 pips, three short (long) positions, position A, B and C, are opened. From now on this price difference will be called gap. All three positions have an initial Stop Loss set at a user specified level, although the default Stop Loss level is set to 100 pips. Position A has a Take Profit level that is set one gap distance away from the opening price, TP A =1xgap, position B has a Take Profit level equal to two gaps distance from the opening price, TP B=2xgap, and position C does not have a Take Profit level. (Picture 1) Once position A is closed, in other words once the first gap distance is reached, position’s B and C Stop Loss is set to the zero loss level (Stop Loss A= Stop Loss B=opening price) and the Trailing Stop Loss Function kicks in starting the free-ride part of the strategy. Gap Trader will close all positions that are still open by next Monday and whose gap distance has not been filled, letting open all wining bets and their free-riding potential for maximum profits. Every Forex pair at the initialization of Gap Trader expert advisor should be given a unique non zero integer magic number value by the user. This number is essential to the function of the expert advisor as it is used on the one hand to distinguish between any non-gap-trading positions that are already open and the gap-trading positions and on the other hand between gap-trading positions on different Forex pairs. 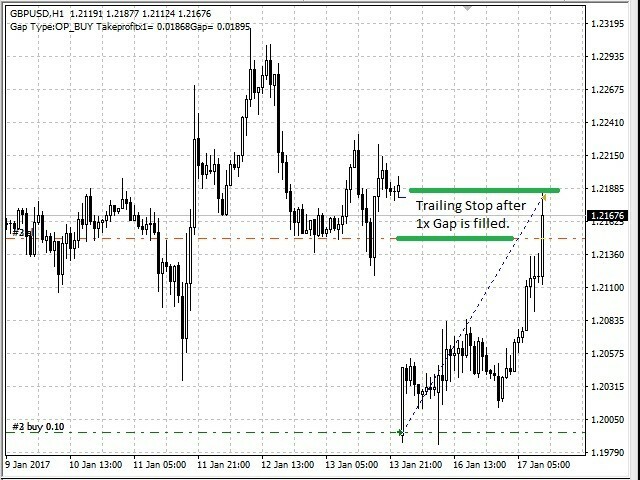 In order to use Gap Trader in a Forex pair, the user has to open the pair’s corresponding chart window in H1 time frame and simply drag and drop Gap Trader icon from the list of expert advisors in the navigate window to that of the forex pair chart. Once you do that the parameter window will be shown. Lotsize:The bet size can be either an integer or a decimal value. Default value set to 1. 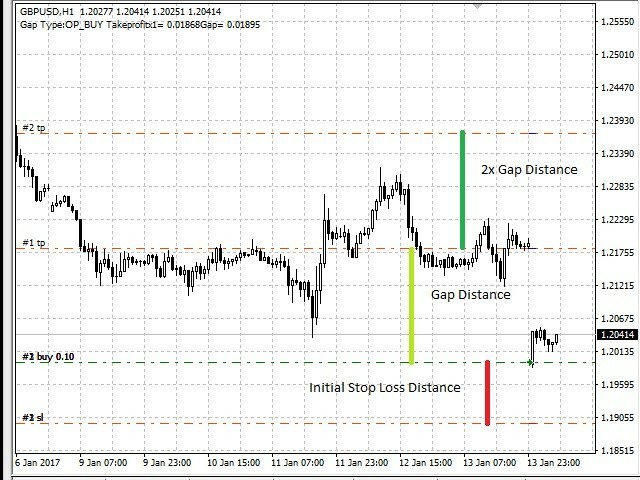 StopLossPips:Initial Stop Loss value expressed in number of pips away from the opening price. Its value should be an integer! Default value set to 100. TraillingStopLossPips:The Stop Loss value that will be used when the Trailing Stop Loss function will be activated. It is expressed in the number of pips away from the current price. It should be an integer! and its default value set to 39. If the gap value is less that the inputted value then Gap Trader will set it equal to the gap value otherwise it will be left unaffected.